Living area with flat screen TV. Remodeled kitchen with microwave, self-clean oven and dishwasher. Sitting loft with futon couch and flat screen TV. Master bedroom with king bed and flat screen TV. Bedroom three with two sets of bunk beds. This townhouse is located in Clearbrook II and offers three bedrooms, two baths, and a beautifully remodeled kitchen. Two of the bedrooms (one offering a queen bed the other, two sets of bunk beds), a full bath and laundry room are located on the lowest floor of the townhouse. The open concept kitchen, dining and living area is located on the mid-level and offers a large flat screen HDTV, BlueRay DVD and gas fireplace. 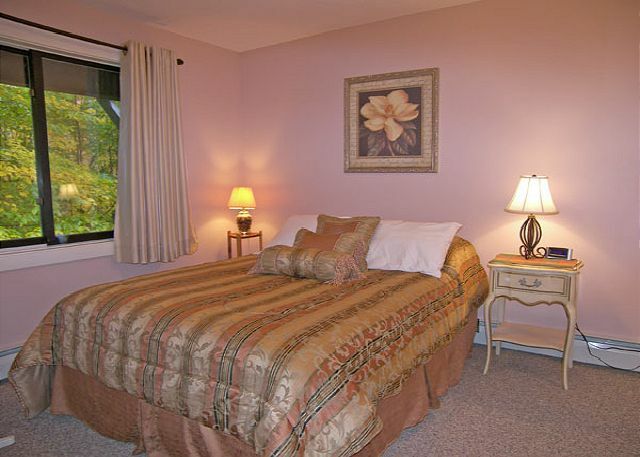 The master bedroom suite with king size bed, large flat screen TV and private bath is on the upper-most floor. Finally, the sitting loft with flat screen TV and BlueRay DVD is on the landing between the living area and master suite. Pool and fitness club membership can be purchased for a separate drop-in fee at the Mountain Club on Loon or the Nordic Inn Club. Large and fairly comfortable condo. A few issues such as screen to porch was not attached and the couches did not recline. Clean condo, generously furnished. We took advantage of the board games provided, and were able to catch some of the Patriots pre-season game!! Great location, I absolutely love Lincoln/Woodstock. We would definitely rent from Loon Reservation Service again. The staff were informative and helpful and I experienced a speedy check-in and check-out. Thank you! Overall, this was an excellent rental experience. The condo unit was even better in person than it showed in the pictures. The online reservation process was easy as was check-in once we arrived. We are very satisfied and hope to be back next year. The only reason I gave "location" 4 instead of 5 stars is that you have to drive to the pool/tennis facilities (but it isn't far). Great accomodation! Kids loved staying here. 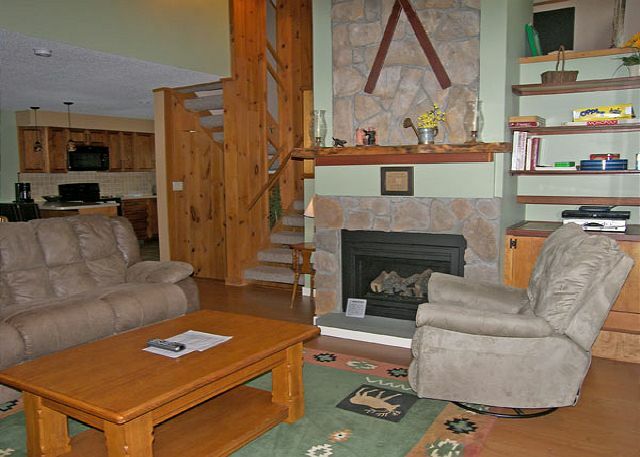 Rental location was perfect for us, in very good condition and accepts pets (one dog for us). Very relaxing, quiet area to come back to after seeing the sights. WiFi is unreliable, though, so if you are in need of internet service, be prepared for that. My wife and I thoroughly enjoyed staying at this condo. There were a few dust bunnies on the bedroom floor but other than that, it was very clean and well appointed. We will definitely be staying here in the future. Over all the rental was very nice. The only issues were the TV in the family did not work all week even after someone came out to look at it, there was also a broken dinning chair and the ice maker did work in the freezer. We loved the condo and it was extremely clean and comfortable. very positive. beautiful unit close to the mountain, comfortable beds! One small recommendation. The owner should provide a kettle for tea drinkers! Glad you had a wonderful stay! There should be a kettle in every home, we'll double check and make there is one for you for your next stay! Very nice condo, and very roomy. The cost was a little high. But we loved anyway!!! We're happy that you loved it! Great fall views from this rental! Gas fireplace worked well, unit was clean and pretty. Management supplied the missing pot holders and tea kettle immediately. Wish we could move in! Our group was very comfortable in this beautiful and CLEAN condo. The pictures make this place look really nice and then you get in there and its even better. All expectations were exceeded and we will certainly be back again. This was our second time staying at this unit. The unit is large and very clean. The only suggestion would to be to bring some extra towels (we always do) as there is only one set per person but rental company does tell you this. Great Location! Beautiful Condo! Roomy, clean, and well stocked! We had a great time on our vaction at our rental property. There was a small issue with the internet and cable TV not working properly and it was resolved very quickly by the rental company. The condo was huge, very clean, and well stocked with amenties for cooking. It felt like being at home, while on vacation. We loved it!! Thanks! We're glad that you let us resolve that small issue for you and that you had a great time. The condo was lovely, clean, roomy, and perfect for a family gathering! There is so much to do in Lincoln, and this served as our home away from home. We would definitely come back! The house is beautiful and very clean as well as modern. The location is very quiet and the view is amazing. I would highly recommend this location to family and friends and would highly consider it for our next stay.